If you’ve ever pondered what might be the coolest modern mini-minivan ever sold in the U.S. then have a look at today’s Nice Price or Crack Pipe Colt Vista. It was so cool they sold it under multiple brands. Let’s see if this one’s price keeps up the mini tradition. Look, kitten fart-levels of horsepower and an automatic transmission do not abrogate the fact that yesterday’s 1974 Chevy Corvette convertible looked amazing. And admit it, you pictured yourself nestled in its funky silver bucket seat nodding to the passersby acknowledging your choice in cars. This was after all the era when Chevy tried to pivot the Corvette from sports car to grand tourer. That made it a somewhat sexier Monte Carlo, but what’s wrong with that? There certainly wasn’t much wrong with the price, at least based on the vote, and one of the closest squeakers in recent memory, it ended up with a 50.5% Nice Price win. I expected it not to be that close. I mean, seriously you guys, did you not see that interior? Speaking of interiors, who doesn’t like cars with lots of space on the inside? That’s especially when the outside doesn’t take up a lot of space for it. 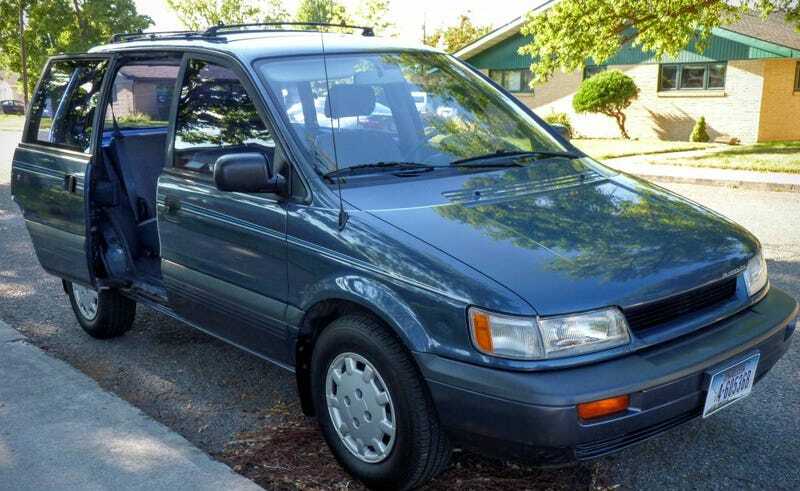 This 1992 Plymouth Colt Vista AWD wagon for example, is an amazingly efficient contraption. Like Dr Who’s Tardis it combines a compact exterior dimensions (and even a blue color) with an interior capacious enough to let run free the egos of both Donald Trump and Jeremy Clarkson. These cars were built by Mitsubishi and sold, variously as Dodges, Eagles, Plymouths, and Mitsubishis here in the U.S.. A five seater, the Colt was positioned below the Expo seven seater and as a way to further exploit Chrysler’s one-time minivan mania. Like Plymouth’s home-grown Minivan, the Colt had a sliding door on one side in back. I cannot emphasize enough what a great idea this is for a small car. I find it hard to believe that today only the Mazda 5 offers sliders on a small vehicle here. Of course, this being from the ‘90s, there’s no door of any kind in back on the driver’s side. That may lend a sense of claustrophobia while inside, but hey, you’ll get over it when you see how nice this car is in there. The cloth seats look to be in perfect shape, as does the carpet, dash, and door cards. I mean even for the modest 110,000 miles, the car looks especially good. Under the hood shows a little sign of its age. There you’ll find a 2,351-cc four pot. A four-speed automatic backs that up and there’s AWD too. The exterior looks as good as the interior, featuring deep blue paint with some sassy side stripes and plastic full wheel covers to spiff things up. A roof rack extends the car’s utility upward. The ad notes that this Colt has been well maintained and always garaged. It also makes the claim that the A/C works and that parts are still easy to obtain. Mitsubishi’s still around, right? This is truly a time capsule car with in its condition and the fact that it actually looks like a capsule. It would make for an excellent family get-a-bout, or a funky ride to impress the neighbors with your old school acumen. The price for either of these options is a modest $3,490. You should take into account the car being in Missoula Montana, a lovely place but with a cost of living lower than many more urban areas. I’d guess that this car would ask over five-grand in San Francisco or Los Angeles. Seeing as it’s not in either of those places, what’s your take on its $3,490 price in its present location? Does that seem like a fair deal for so funky a family ride? Or, is this a Vista for which you can’t envision paying so much? Missoula MT Craigslist, or go here if the ad disappears.